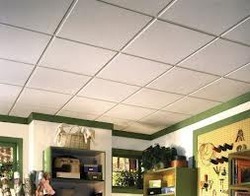 We are a flourishing enterprise, engaged in offering Acoustical False Ceiling Tile to our esteemed clients. With rich industry experience and skilled professionals, we plan and implement this service as per the specific requirements of our clients. Our offered glazing works are well known among the clients for their timely execution, reliability, flexibility and other salient features. Moreover, these are delivered to the clients at reasonable rates as well. “Panchal Interior”, was incorporated in the year 2011, at Ahmedabad (Gujarat, India). We are engaged in trading and supplying a vast array of Colour Coated Sheet PPGI, Polycarbonate Sheet, Mild Steel Letter Box, Self Tapping Bolt, Industrial Door, PVC Door, PVC Ceiling, PVC Product, Rubber Industrial Mat, Designer Canopy, Wooden Flooring, Synthetic Surface, etc. These products are admired for high tensile strength, anti-corrosive finish, durability and ductility. We are one of the leading Govt. Approved Civil Contractor. Our company lays great emphasis on the quality of products offered. Thus, we have chosen industry's leading manufacturers as our vendors. Our restless, motivated team comprises well qualified professionals and technocrats who identify work targets, and assiduously apply themselves to achieve them. Further, we believe that the trust of a client can only be gained by providing him/her the right products at the right time. In this regard, we store our products in bulk quantities at our sound and spacious warehouse to facilitate prompt delivery schedules.